As you know, I am always looking for healthier, home made recipes to replace some of my favorite processed pre packaged foods that we all love so much. 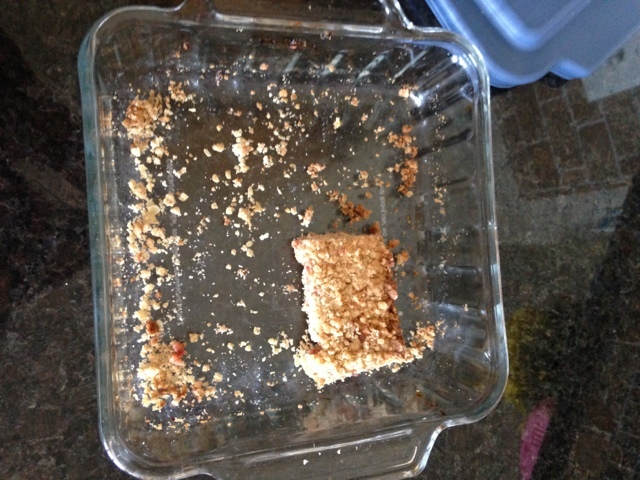 Well, one of our family favorites are nutri grain bars. I have found a somewhat healthier version from Trader Joe's. My daughter loves those and will eat them every day. Although they are a bit better I really wanted to find something with fewer ingredients and that I could make at home. I think I found the solution. Thank you Pioneer woman for this amazing recipe. I took a picture of the finished product below, but it was a day after I made them and as you can see, they were eaten up pretty fast. I make the actual recipe and cut it in half. Next time I am going to try it with different jam and possibly even add peanut butter. YUM. Preheat the oven to 350 degrees F. Butter a 9-by-13-inch rectangular pan. Mix together the butter, flour, oats, brown sugar, baking powder and salt. Press half the oat mixture into the prepared pan. Spread with the strawberry preserves. Sprinkle the other half of the oat mixture over the top and pat lightly. Bake until light brown, 30 to 40 minutes. Let cool completely, and then cut into squares. I'm a wife, a mom and full time pancreas. Lover of holiday eve's, cooking, party planning and exploring.